The fields at Patchen Wilkes Farm are once again filled with a dozen new mares and foals, and as usual, a few of the farm's trademark white horses are standing out like snowdrops against the green grass. 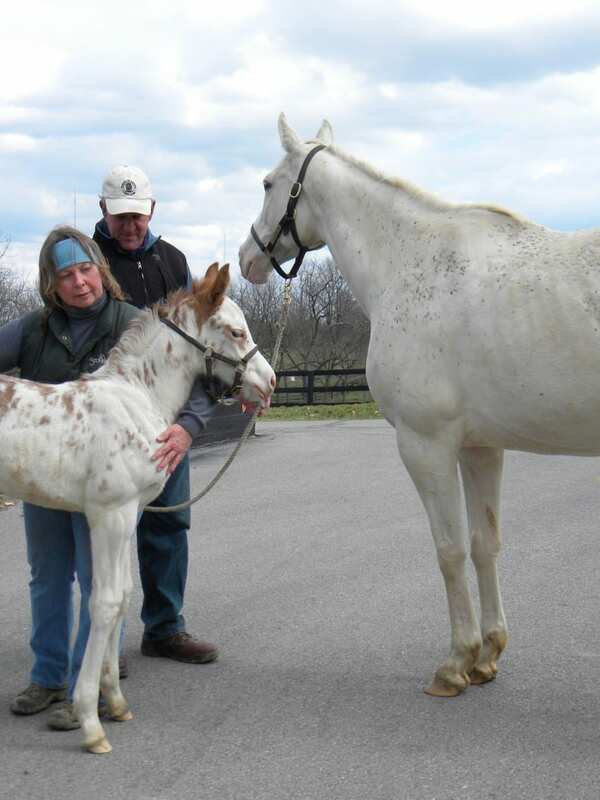 The farm welcomed a new white foal in March to white mare Spot of Beauty and Thunder Gulch, and this one breaks even the Patchen Wilkes color mold. “This one's full of color. He looks like a paint horse. He's wild looking,” said farm manager Barry Ezrine. The foal has a touch of chestnut on his ears, similar to that of a “medicine hat” paint horse. Medicine hat paints are considered by Native American culture to have special powers. At only a few weeks old, colt seems well aware of the fact, prancing and playing alongside his dam, who has some distinctive spots of her own. White horses have historically been symbols of power, fertility, and prophecy, and are vehicles of warriors and gods in ancient cultures across the globe. More recently, Japan's Emperor Hirohito was pictured riding a white stallion in propaganda media during World War II. The horse became a symbol of Japanese dominance and was ultimately shipped to the United States after the war was over for public appearances, where he was defined as a legal partner in the rodeo exhibitions at which he appeared. Although Patchen Wilkes is well-known for its white Thoroughbreds, it doesn't have the market cornered. 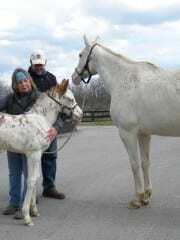 Several miles away, in another foaling barn, white mare Turf Club gave birth to white filly by Old Fashioned that same month. The filly also wears a medicine hat. The Patchen Wilkes colt marks the sixth generation of white Thoroughbreds on the farm since the birth of the famed White Beauty in 1963. Although she was the first white Thoroughbred registered by the Jockey Club, legend has it that the truly original white Thoroughbred was steeplechase runner White Cross, born in Tennessee in 1896. Another case supposedly occurred in Germany in 1925, and a third—Mont Blanc II—was born in France in the same year as White Beauty. None of the horses were known to be directly, closely related to each other. In White Beauty's case, it's thought that she got the genetic ingredients for her white coat from her sire, the chestnut sabino named Ky Colonel, who also produced War Colors. War Colors was registered as gray or roan, but in reality was likely white also. Curiously, Turf Club doesn't seem to have White Beauty or Ky Colonel in her lineage, so where did she get the genetic blueprint for her coat? Unlike some genetic oddities, white horses are not the result of two rare genetic carriers being paired together, explained Samantha Brooks, PhD, assistant professor of equine genetics at Cornell University. Instead, Brooks said, they are basically genetic mutants. The spontaneity explains why Turf Club and Spot of Beauty could look so similar without actually sharing much DNA—and why Airdrie Apache seems to come from another pedigree line altogether. “We think they are spontaneous, novel mutations in most cases because usually, once they appear, are dominantly inherited so they wouldn't be able to hide for many generations, waiting for the right combination to appear,” said Brooks. For this reason, a gray horse isn't any more likely to throw a white foal than a bay, since the gene for gray coat color is in a completely different location from the KIT gene. Spot of Beauty's rather large freckles and her colt's sacred “hat” don't preclude either of them from being registered with the Jockey Club as white Thoroughbreds, according to registrar Rick Bailey. “White is defined in the color guide section of the Rules as follows: The entire coat, including the mane, tail and legs, is predominantly [emphasis added] white,” he said via email. 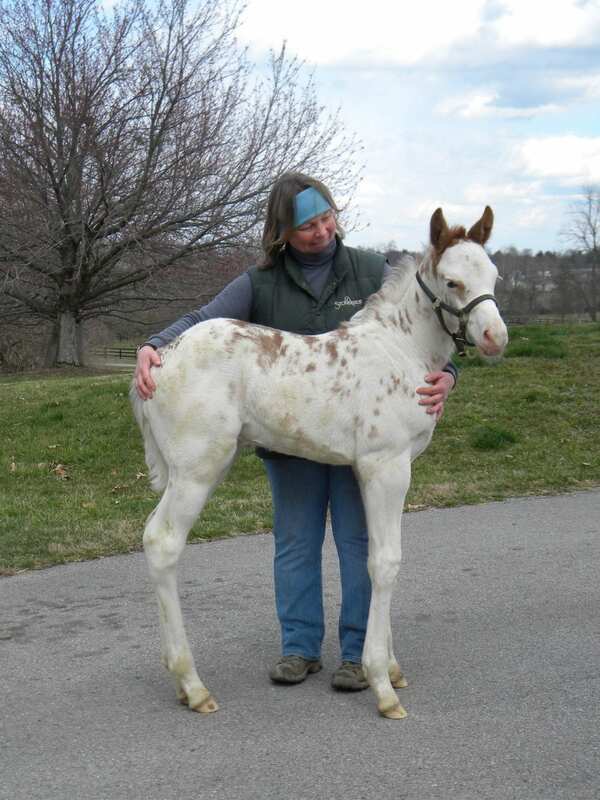 Distinctive markings such as brown ears or spots would be noted on the foal's papers. Ezrine said that although the line of white horses has been the farm's trademark for 50 years, he doesn't manage or breed them any differently than any other Thoroughbred. The only management difference, he said, is that the farm might go through a little more shampoo than most. Following the death of Patchen Beauty in March, Spot of Beauty and Precious Beauty are the last remaining white broodmares on the farm, but Patchen Wilkes does have a 2-year-old colt in training. Ezrine doesn't anticipate he will get back into the business of stallions when the colt retires, however (the farm's only stallion, The White Fox, died of colic in 2010). The farm is operating as normal although the land it sits on has shrunk with the construction of roadways and a subdivision. While construction in the subdivision halted after the housing market crashed, the farm will cease operations if and when it runs out of land. 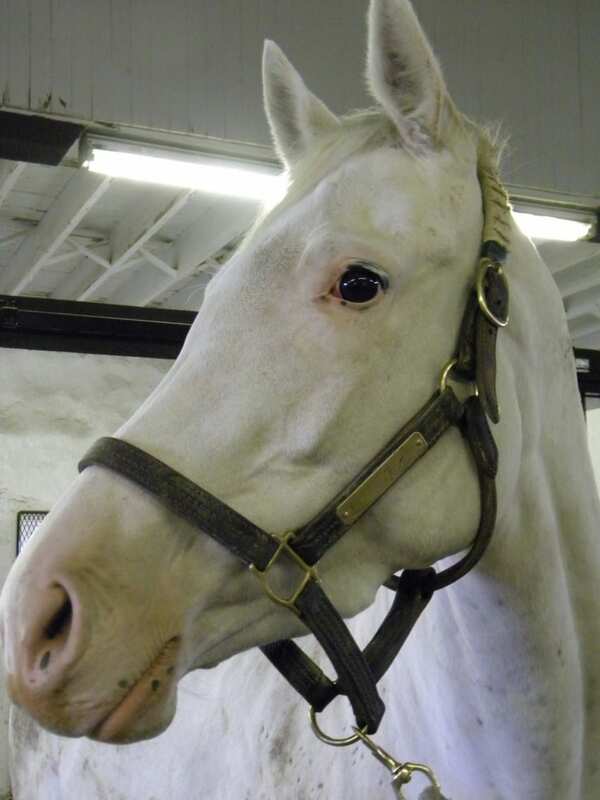 In The White Fox's time at stud, which he spent at Hopewell Farm, he was, perhaps surprisingly, not courted by sport horse breeders on the hunt for his unusual color. The case of Airdrie Apache, the sabino son of white mare Not Quite White (no close relation to White Beauty), is quite different. His coat allows him to be double registered as a Paint—a commodity that is the driving force behind his popularity at stud. Airdrie Apache and white Thoroughbred stallion Bright White (also of no direct relation to Patchen Wilkes' band) stand at Desert Oasis Performance Horses in Nevada. The white coat has gotten Airdrie Apache descendants more than just commercial appeal—Arctic Bright View, a son of Panoramic and white Airdrie Apache mare Arcticanna, made his career as a movie star. He will be starring in the upcoming Lone Ranger movie as the Ranger's horse, Silver. This entry was posted in Ray's Paddock by Natalie Voss. Bookmark the permalink.